Join us for this one-day “Shredding Event” from 10 AM – 2 PM on Friday, May 3rd. 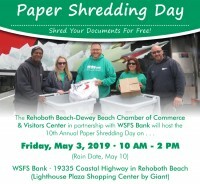 The community is invited to bring their used paper to WSFS Bank on Coastal Highway for shredding. There is no charge, but donations are welcome. Not sure what you can shred? Any paper based printed material, X-Rays, and more! Staples, rubber bands, folders, paper clips, etc. do not need to be removed before shredding occurs. Materials must be removed from three ring binders prior to shredding. Shredding occurs on site in the WSFS parking lot.